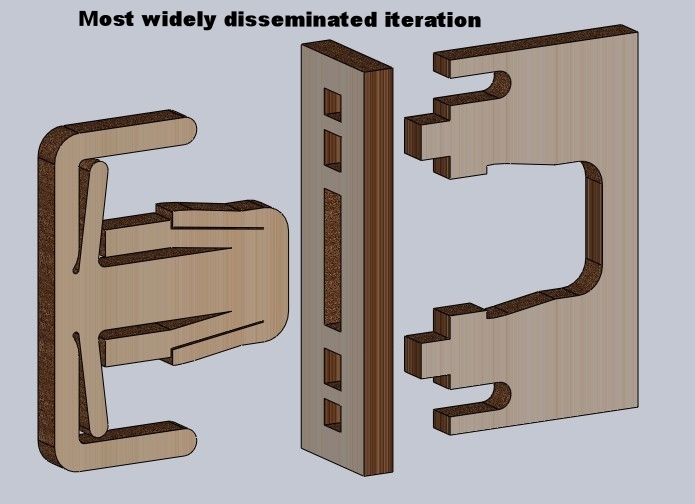 Laser cut press fit designs are dependent on laser kerf and material tolerances, and both are highly variable. Likewise, fasteners cost money, and adhesives are lame. These design constraints made it difficult to create open-source designs that I felt comfortable disseminating. So I designed a laser cuttable universal snap fit. The USF has been cut out in Denmark, Thailand, Russia, a fair amount of schools in the US, and a bunch of other places. I learned how to do stress analyses from my E14: Statics and ME80: Strength of Materials classes, and was able to do an average shear stress analysis hand calculation (shown below); however, I was dissatisfied because what I really wanted was max shear stress. So instead of learning how to hand calculate it (and how to factor in radii), I decided to learn a more efficient, automated means of doing so by teaching myself how to do it in Solidworks. With the tensile yield strength of ABS (41 MPa - 60 MPa), my design only experienced 40% - 60% of the maximum allowable stress! Finally, material selection, as usual, was a big decision. I ended utilizing 3mm birch interior grade plywood due to its low cost, relative global accessibility, and its awesome capability to not produce a ton of ashy particulates that clog up your lenses and respiratory system due to the type of glue used to lay down the plys. However, for my stress analysis I chose ABS for two reasons: 1. I did the stress analysis after I had prototyped myself forward in ply, so I knew it worked. 2. If this were to be manufactured at any meaningful volume, no way could it be plywood. The Universal Snap-Fit was designed during my time with the TLTL.